We can learn a lot about Benjamin Franklin just reading about the food (and drink) he enjoyed. At every era in Franklin's life, there is a food connection that provides insight. In 1723 Boston-raised runaway Benjamin Franklin arrived in Philadelphia as an ill-dressed seventeen-year old. He walked the streets looking for work and lodging and he was first noticed by Deborah Read, the woman he would marry seven years later. At the time he was carrying loaves of bread tucked under his arms. He had expected to purchase a few pocket-sized biscuits, instead he had been amazed at how much his few coins would buy. Find a link to Ben's Boston biscuit here. On his first trip to London (1724-26) journeyman printer Benjamin was called the "water American" by his fellow workers because he wouldn't drink beer for breakfast as they did. He persuaded some of them to join him for healthy meals of hot cereal instead as a way to save money and be stronger. During the 1740s Franklin tested his electrical theories and the power of electricity on chickens and turkeys, converting the fowls to dinner. He claimed that those birds "ate more tender than usual." For a tasty Franklin-era turkey hash follow this link. When Benjamin Franklin led troops during the French and Indian War in a 1756 action in northeastern Pennsylvania, his wive Deborah sent delicious dishes including roast beef, veal, and minced pie for him to share with his fellow officers. Franklin wrote three dozen sayings about food in his Poor Richard's Almanacs over the 25 years he wrote and published the annual book. Most of them, such as "To lengthen thy life, lessen they meals" focused on temperance and moderation. Franklin recognized the cultural and personal value of growing food. He made it an important part of his vision for the institution that would become the University of Pennsylvania. The students should be taught "everything that is useful" including "a little gardening, planting, grafting, inoculating, &c. to be taught and practiced." 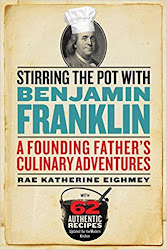 During his years as a representative of the Pennsylvania colony in London (1757 to 1775) Franklin cooked his own breakfast hot cereal and chocolate in small pots on top of the heating stove in his rooms. He even had a special pot designed for stove-top cooking of a chicken. He liked it so much that he had it brought to him surreptitiously from England to France during the American Revolution. His wive Deborah sent a wide variety of American foods for Benjamin to enjoy in London-- smoked venison, hams, cornmeals and flour, apples, and cranberries. Here's a link to a delicious, easy cranberry pie. Franklin's French household accounts for 1783 show that he entertained, or at least was feeding, a lot of people. Among the more than 150 different kinds of fresh foods purchased there were dozens of different kinds of fruits and vegetables. The butcher's bill accounted for 9,162 pounds of beef. They purchased at least a chicken a day. And the kitchen bought 2,330 apples, one of Franklin's favorite fruits. 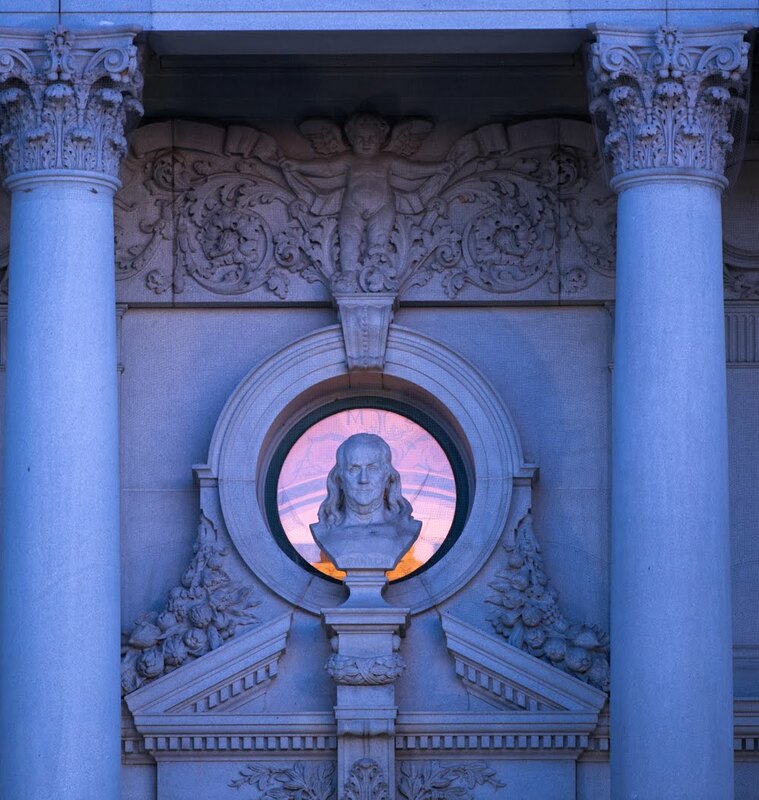 In 1785 diplomatic hero Benjamin Franklin returned from France to the now United Sates of America. Two years later follow attendees to the 1787 Constitutional Convention cooled off from the heat of the summer and discussions with casual refreshments under his garden's huge mulberry tree.